Home > That Timeless Bookshop > Washington D.C.
2008. Hardcover. Like New. Minor curling on dust jacket. 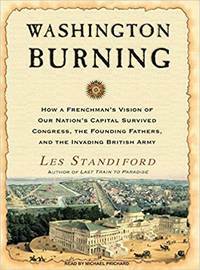 An early history of Washington, D.C., describes how the city became the nation's capital, the design of eccentric French architect Pierre Charles L'Enfant, Washington's efforts to balance the design with opposition from fiscal conservatives--which mirrored the struggles of a fledgling nation--and the 1814 burning of the city by British troops. 50,000 first printing.